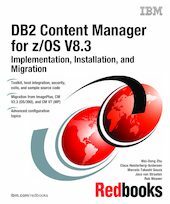 This IBM Redbooks publication covers IBM DB2 Content Manager for z/OS Version 8.3 implementation, installation, and migration. It is intended to be used in conjunction with the product publications. In many areas, it focuses on the important topics and issues related to the planning and execution of these tasks rather than providing comprehensive information to perform the tasks. This book is aimed at architects, designers, developers, and system administrators of Content Manager systems. In this book, we introduce Content Manager for z/OS V8.3 and provide information on how to implement a Content Manager for z/OS system. We cover general implementation topics and provide special z/OS related topics including Content Manager Toolkit for z/OS, host integration, Content Manager security, and Content Manager exits. We also describe the product installation, and cover system migration from ImagePlus OS/390, Content Manager V2.3 for OS/390 (also known as Content Manager V7.1 for OS/390), and Content Manager V7 for multiplatforms, to Content Manager for z/OS V8.3. In addition, we cover information on traces and logs. We address advanced configuration topics, including configuring multiple Content Manager instances in the same LPAR, issues and considerations when setting up a Content Manager system in the Sysplex environment, and changing default access to DB2 plans and packages. By reading this book in conjunction with the product publications, we hope you learn the basics and gain some insights on implementing, installing, and migrating a Content Manager system on the z/OS platform. We also hope you enjoy the hints and tips we provide throughout this book to help make your job easier.